In software development, Traceability is a very famous term, specially in companies implementing CMMI-based process improvement. Usually the concept is substituted for another term, which is the 'traceability matrix'. Most probably it was originally proposed as example implementation of what is coined as 'Requirements Traceability'. Later on, it became the de-facto implementation of requirements traceability, and finally replaced the original concept in the heads of many! The fact is, traceability is not a matrix! This is true, specially if you want to make value of this very important technique. 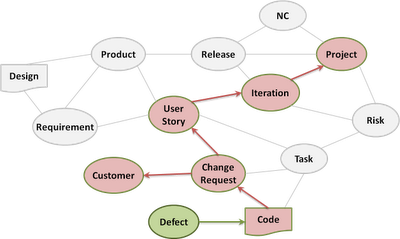 Rather, it is a dynamic network of relationships, in which requirements have a grawing set of relationships to all other artifacts in the project. As you can see, any requirements is related to so many other concepts, artifacts, or other workitems. Requirements entities can trace to each other (white), and trace to other information (green), and or trace to physical artifacts (gray). A single requirement may be traceable to tens of other artifacts, and in turn, each one may of them may be traceable to some others. What Value Does Traceability Add? If there is a defect reported by a customer, and we want to know its root cause. According to the scenario below, the defected code is traced back to the reasons of change, which is found to be a change requested by the customer sometime ago. Other information about the change request can be deduced. This is also called Backward Traceability. In healthy configuration management environments, defects can be easily traced back to the code, change requests, and many other information, which may enable the team to identify the real reasons behind the defect. Traceability enables the team to study the impact of a change and assess its costs and risks. In the scenario below, the customer requests a change on an already implemented user story. To assess the change, the team revisits the written code, the impacted design and products, etc. The team assesses the cost of the change request, by evaluating the changes incurred on all artifacts which will possibly change due to this request. This is also called Forward Traceability. The third value-add from traceability is to assess whether all requirements are complete with respect to some other artifact, like design or test cases. So, by simple query, we can deduce which user-story or change request which still do not have any related test cases or design artifacts. In fact, in Agile environments, implementing traceability takes very little overhead. There are techniques to minimize the overhead for linking artifacts and build the traceability network seamlessly. Many of these techniques are exercised in the Agile Configuration Management Workshop, which I deliver at SECC. Finally Changed The Title of My Blog! I spent so long thinking about changing the title of my blog. For several years, it used to be "Tales of Software Process Improvement". For all that time, I used to narrate many experiences in software process improvement. 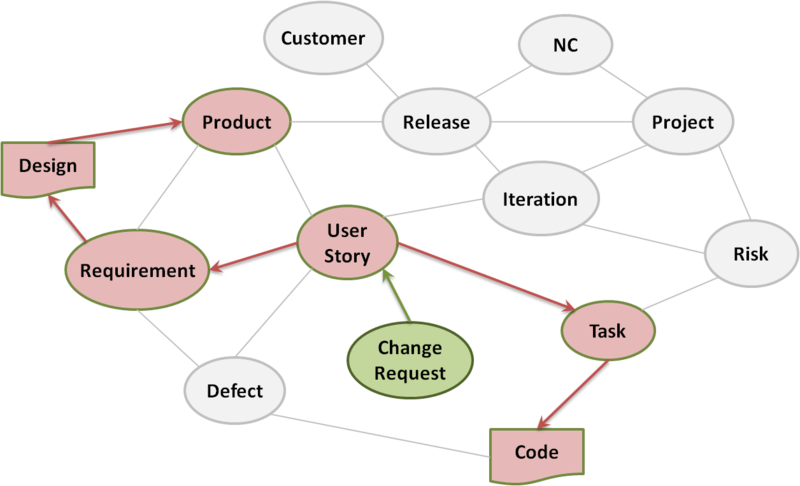 However, what is more realistic about this blog is that I was narrating experiences of adopting Agile or RUP values and practices, and this is why I decided to change it to "Tales of Agile Software Development". 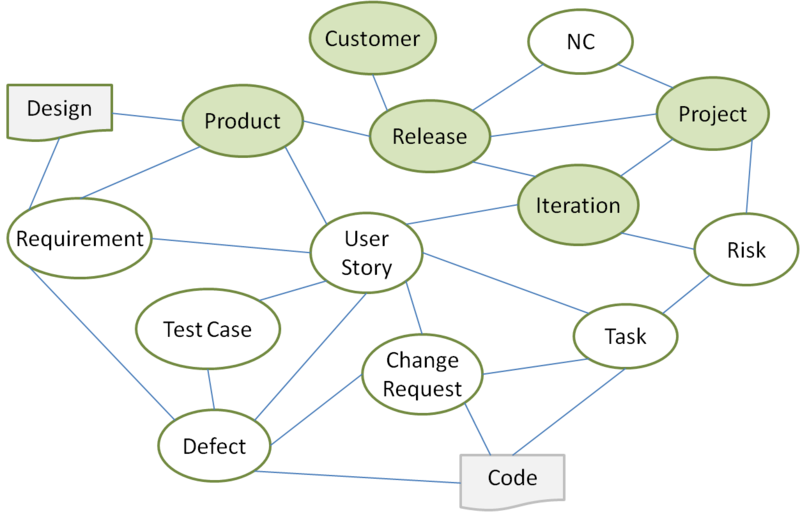 I'm a big fan for Agile and Lean software development. I can see and feel how it changes people lives, and saves a lot of time and waste. Most important, it makes people master and foster the most precious skill they would have, which is learning and gaining knowledge.